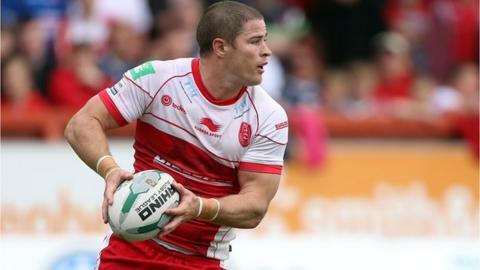 League Leaders' Shield winners St Helens have signed Travis Burns from Hull Kingston Rovers for £60,000. The 30-year-old Australian stand-off has signed a three-year contract at Langtree Park for the 2015 season. "Travis is a key signing for us," said Saints chairman Eamonn McManus. "He's a proven, experienced stand-off, who will bring both quality and depth to our half-back combinations. He will also bring directness and toughness, as well as a strong kicking game." Travis Burns began his professional rugby league career at Manly, being voted the Sea Eagles' rookie of the year in 2006 before joining North Queensland in 2008. Having played for the Cowboys for two seasons, making more than 30 appearances and scoring seven tries, he moved to Penrith Panthers prior to the 2010 season, where he first linked up with Luke Walsh. Went on to appear 55 times for the Panthers, amassing more than 100 points in the process, before being signed by Craig Sandercock for Rovers for the 2013 season. Former Rovers head coach Craig Sandercock was Burns's assistant coach at Manly, Australia. And he proved to be a big influence on Burns signing for Rovers from Penrith Panthers in September 2012. In another connection with his native country, Burns will link up with Saints half-back Luke Walsh, his old Penrith team-mate. "Hull KR have been great to me and my family," said Burns. "Although I'm sad to leave, I am really excited to be joining Saints. It will be great linking with my friend and former team-mate Luke Walsh. "Saints have a strong team who are looking to win silverware over the next few years and I am looking forward to being part of that." Burns has scored close to 200 points in more than 40 games for the Robins, including twice being on the winning team for Rovers against Saints.